There’s nothing better than a summer holiday away, exploring a new place with your friends and family and getting some well needed rest. 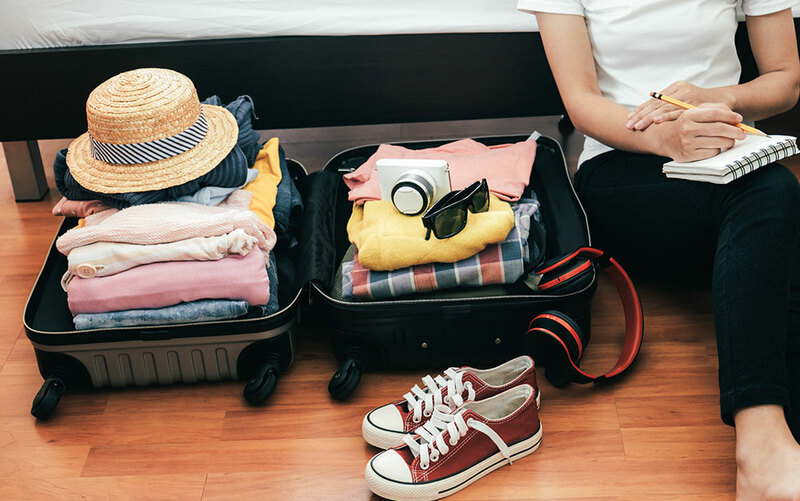 In the run up to your trip, it’s easy to get wrapped up in the packing and planning and forget about what you’ll be leaving behind. Remember that any plants you grow depend on you to survive, just as a pet would. They need their regular watering even though you might be away. This is especially true during the summer months when water evaporates rapidly from the soil and plants can quickly dry out. 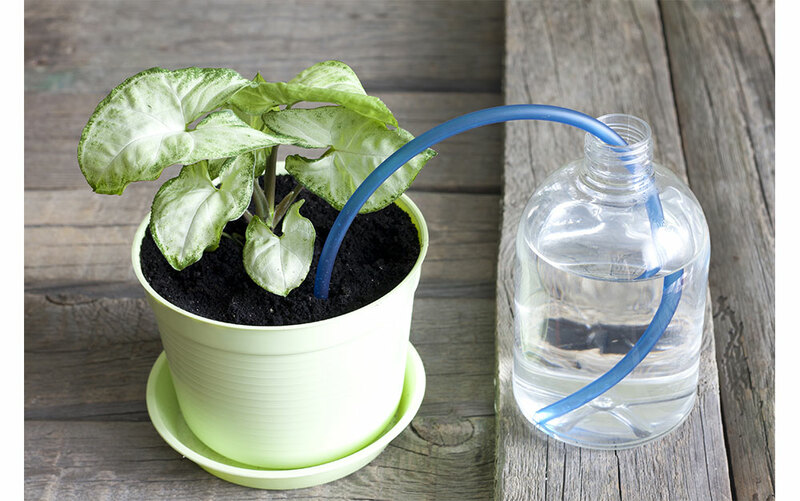 Luckily, there are lots of clever ways to keep plants hydrated whilst we aren’t there to care for them. Whether you are going away for just a few days, a couple of weeks or even months at a time there are methods you can use to keep your plants healthy until your return home. Many can even be done using recycled materials from around the house – so there’s no need to break the bank. 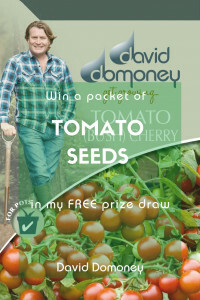 The first thing to do, no matter which method you use, is to give all your plants a thorough watering before you begin. 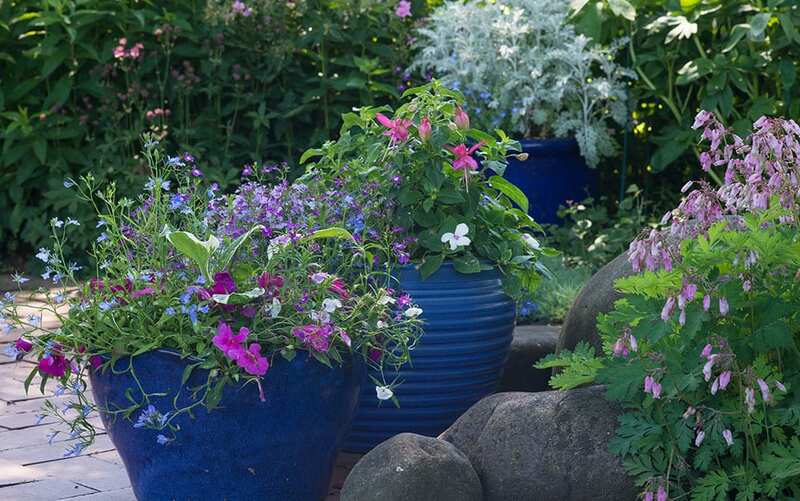 Soak pots, containers and hanging baskets at the plant base until the water rises above the soil. Allow this to soak in and then repeat. 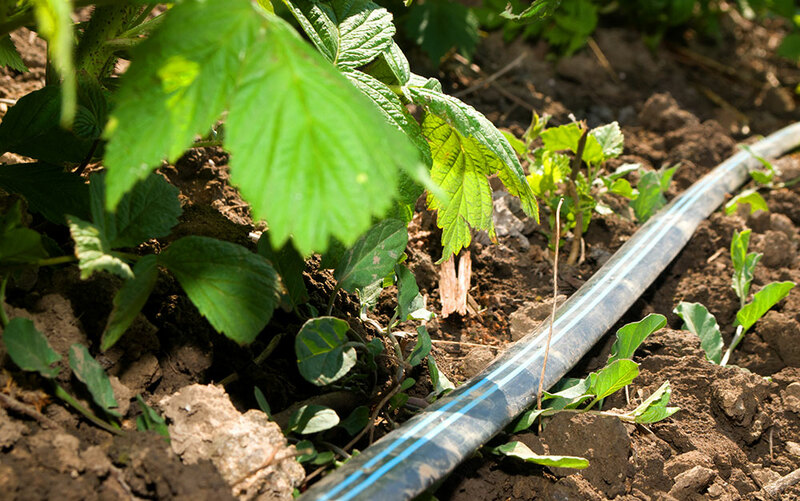 Use a hose to water plants in your beds and borders, leaving the hose at the base of thirsty plants for several minutes, pressing your finger into the soil afterwards to check the water has soaked at least the first several inches of the soil before moving on to the next plant. Take care not to simply sprinkle water on the foliage as this will evaporate away quickly and can also encourage disease. And don’t forget the power of shade! Moving potted plants into a shady spot for the period while you are away will help them to maintain hydration and slow the rate at which they dry out. Be careful not to use shade cast by the eaves of your house – as this will prevent any natural rainwater from being able to reach them. Do the same thing with houseplants – move them away from sunny windowsills and into shadier spots to help them stay hydrated while you are away. 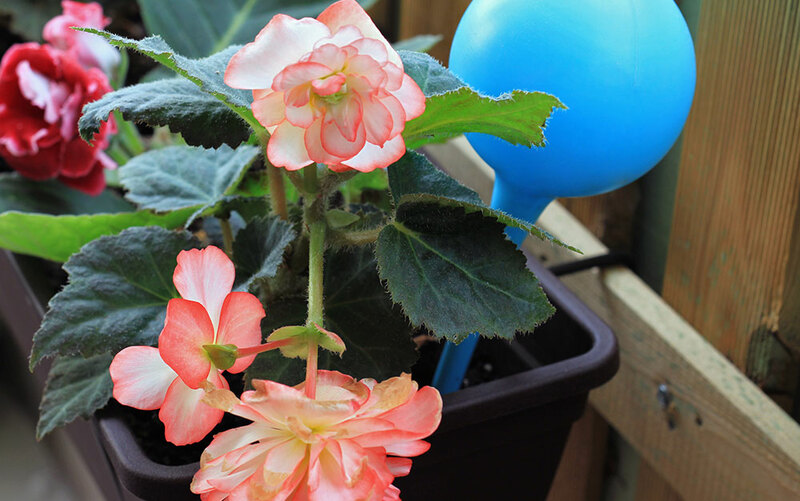 This method is perfect for keeping potted plants watered if you are away for up to a week. Wash out an old wine bottle and fill with water up to the neck. For smaller pots you may wish to use a smaller bottle such as a beer bottle. 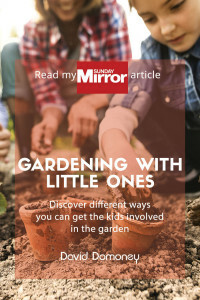 Place your thumb over the top of the bottle and flip it over, and then bury the neck of the bottle into the soil of the pot, removing your thumb. The neck of the bottle should be wedged firmly a few inches into the soil and should be fairly secure. You can use a permanent marker and draw a line on the bottle at the water level. Come back a few hours later to check the water is draining properly – if the water level is still in the same place then soil may be blocking the bottle. Take the bottle out and insert again. Plastic bottles can be used in a similar way to wine bottles but can also be used in your beds and borders. Use a large plastic bottle and poke two holes in the bottom and three to five holes on one side of the bottle. 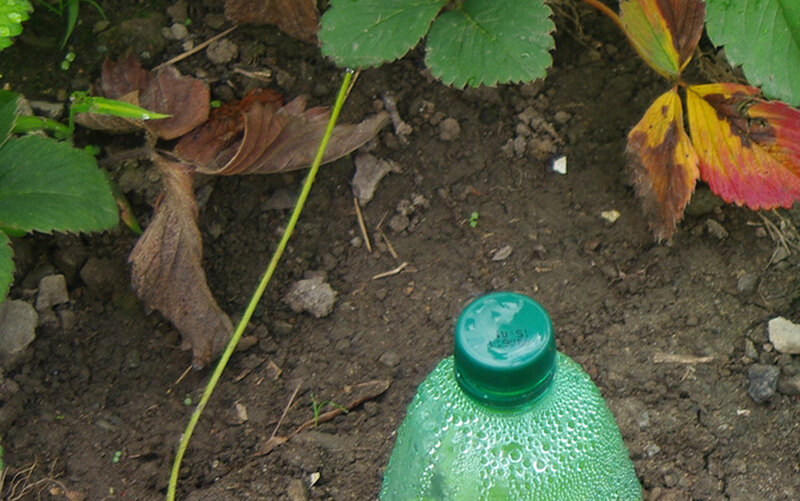 Dig a hole next to your plant deep enough to bury the bottle in up to the neck. Once the bottle is in place with the holes facing towards your plant, fill with water and pat the soil around the bottle to firm it in slightly. You can replace the lid if you want to slow down the water rate or leave it off if you are only going away for a short period. Check back after a few hours to make sure a little of the water has drained away – if no water has drained out, loosen the cap a little. If too much water has drained away, tighten the cap. Another clever method of keeping plants hydrated whilst you are away is using a water wick, which is especially good for indoor plants. Fill a jar, cup or bottle full of water and place next to your pot, positioning it out of direct sunlight, and elevated so that the mouth of the container is higher than the base of the plant. The longer you are going away for, the larger you will want this container to be. Cut a length of cotton twine, plastic tubing or string, you can even just cut strips of cotton fabric about one inch wide. Place one end of the wick into your water container, making sure it reaches the bottom. Push the other end of the wick into the soil at the base of your plant, about three inches deep. Try to keep the wick out of direct sunlight to avoid evaporation – put some duct table over the top of your water container if you are worried about evaporation. You can even place the pot over the container and poke the wick up through the drainage hole – this reduces evaporation and helps to keep the soil at the base of the plant moist. 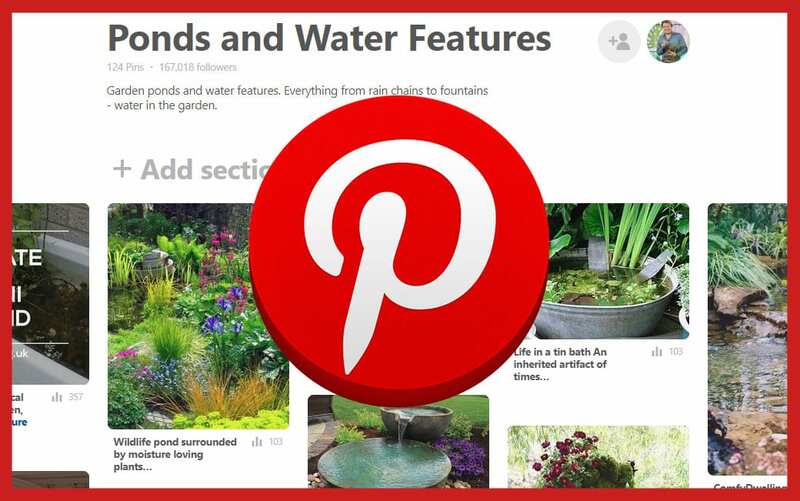 Indoor potted plants can be kept hydrated through this method, using the bathtub or shower tray and some old towels. Lay several folded towels down in the bath or shower tray and soak them when water until dripping wet. Block the drainage hole or put in the plug to prevent water from draining away too quickly. 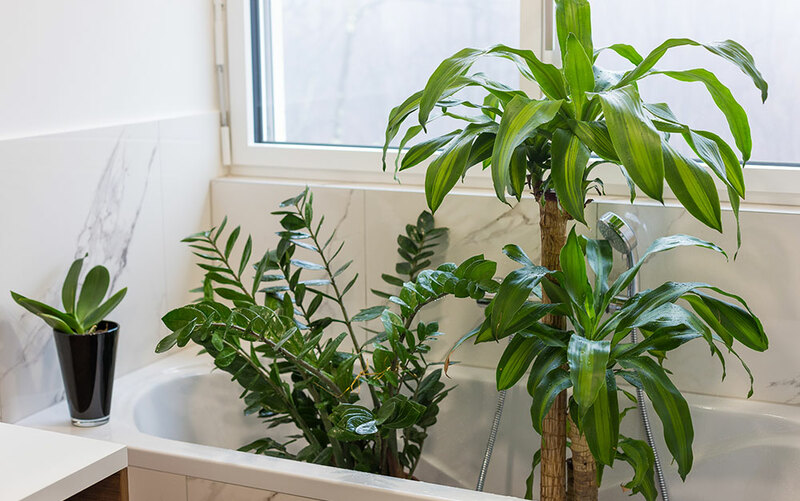 Collect all your houseplants from around the house and place them all together in the bath or shower, on top of your wet towels. Not only will the plants be able to benefit from the moisture given off by each other, they will also be able to use moisture evaporating slowly from the towels. This humid environment is the perfect stay-cation for your plants! Draw the shower or bath curtain, making sure to keep the lights on if you can. As most baths are white, the light reflecting from the bath should also help your plants in your absence. 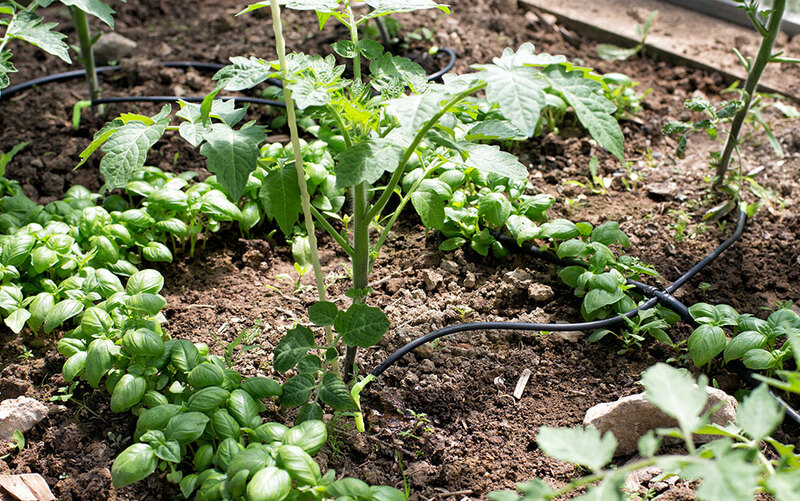 If you have the budget for it, there are many different types of irrigation systems on the market that can be used to allow a controlled amount of water to your plants at set times while you are away. 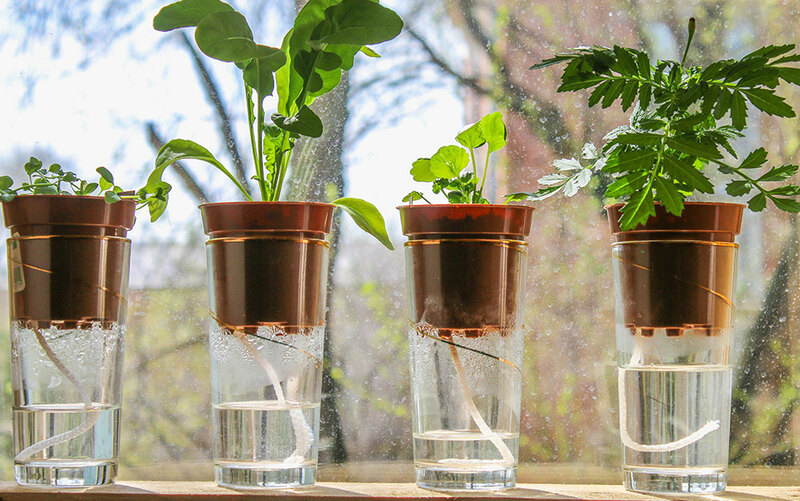 This is a costlier method but can help to put your mind at ease if you are worried about your plants running out of water, or you plant to be away for a longer period of time. 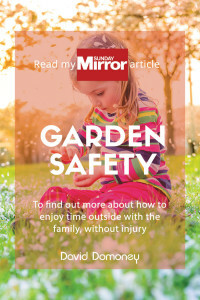 A simple yet effective way to ensure your plants are looked after while you are away is to enlist the help of a friend or neighbour. Make sure you offer to return the favour when they are going away! 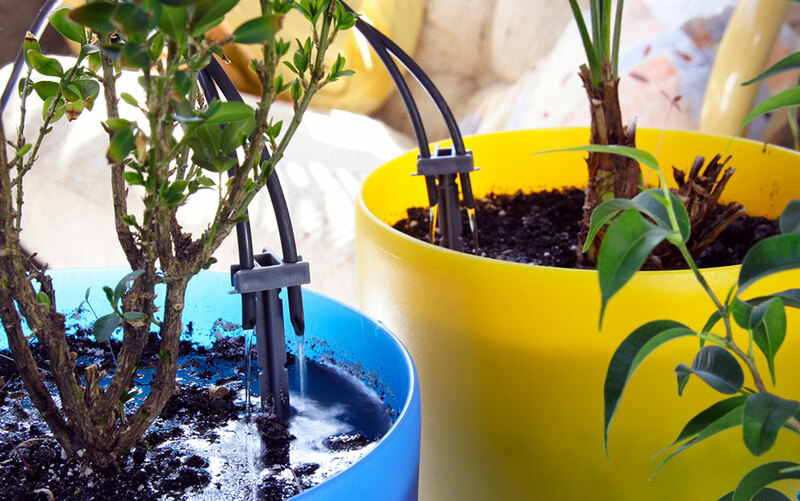 To make things easier for them you could always set up one of the methods listed above, meaning your plant sitter only has to pop in once or twice to top up the homemade watering systems, rather than every day you are away. 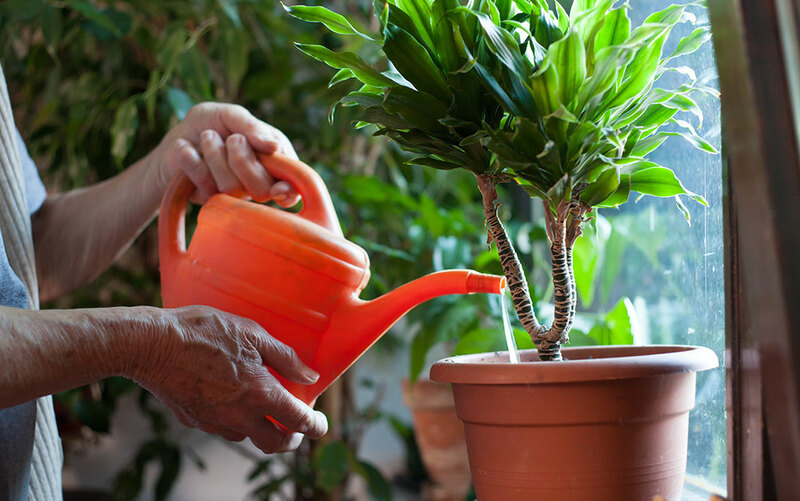 Leave detailed instructions for how much water your plants require – especially if they aren’t used to caring for plants. 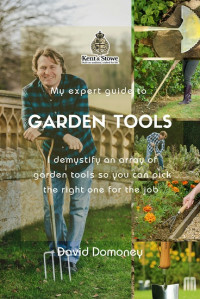 What may seem obvious to you may not be for the novice gardener. 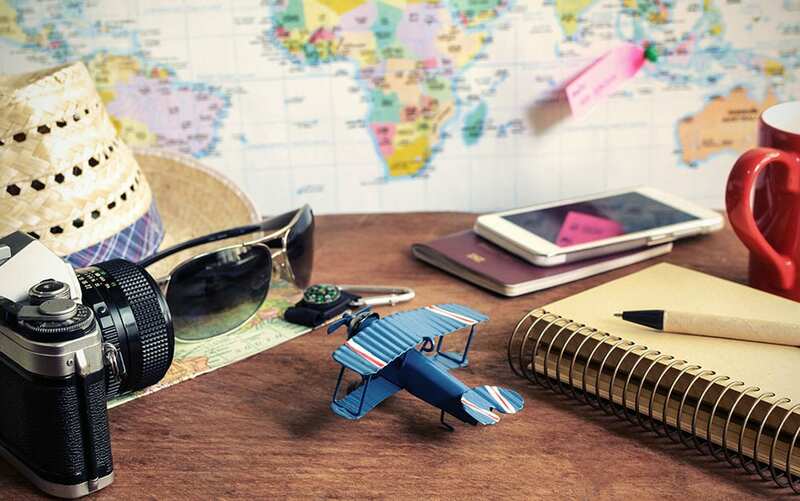 Feeling inspired by your holiday to Europe? 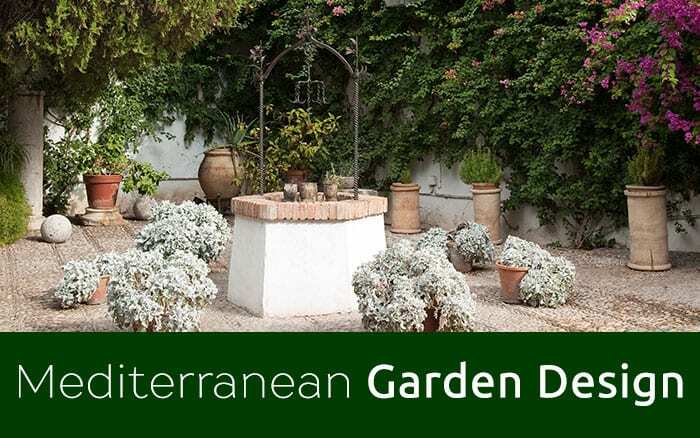 Check out this blog on getting that Mediterranean look in your own garden.